Ancient fossilised pieces of a sea creature called a ‘Crinoid’, a type of Echinoderm which is related to a starfish or a sea urchin. They are sometimes referred to as ‘sea lilies’, but they are an animal, not a plant. These fossils are ancient sea creatures, a form of echinoderm that existed almost 300 years before the dinosaurs. They survived the Permian extinction, and examples of these animals still survive today – although they are a little different to their predecessors. They are commonly known as sea lilies, but they are an animal – not a plant. They have frond like protuberances that capture small pieces of food, perhaps plankton and similar. The stem of the creature is commonly found – in gravel, loose or rough rock, and in many other places. I’ve found Crinoid speciments in the loose gravel on my front garden. 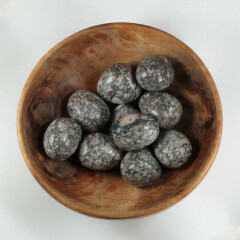 These stones are said to be helpful with transformation, whether that is personal growth, or something more literal – moving from the old to the new, for example. 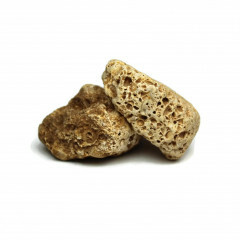 Many people also believe that fossils help to keep us grounded, due to their strong connection to the earth – they were literally living beings which died and were turned to stone. A stunning Crinoid fossil display – image courtesy of Wikimedia. 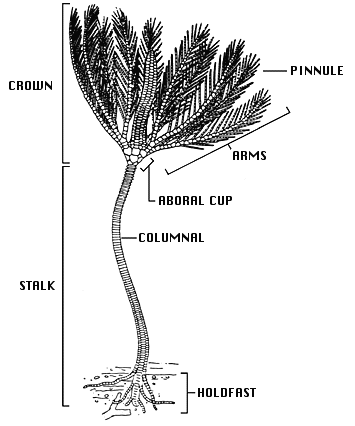 The anatomy of a Crinoid, showing the leaflike ‘arms’ and the column which is commonly found. A present day, live Crinoid, image via Wikimedia Commons. 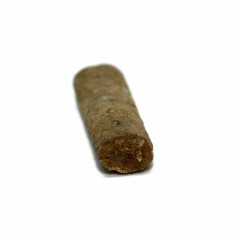 A common fossil Crinoid stem, found in household gravel.